The lessons for this week begins by introducing us to the Apostle Paul, the author of the epistle of Galatians, by looking at his former life when he was known as Saul of Tarsus and "was ravaging the church', Acts 8:3. For reason best known to the quarterly lesson author, this has been done instead of evaluating the claims Paul makes of his apostleship from within the context of Galatians. In-as-much as this is the first week of a new quarter titled 'The Gospel in Galatians' it would have seemed appropriate to make the lessons for this week an introduction to the epistle of Galatians by actually turning to and examining the text of the epistle of Galatians. 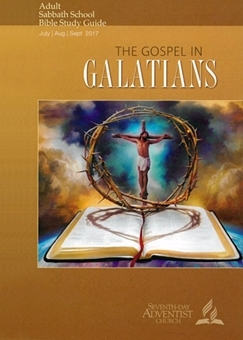 Since the Apostle Paul introduces himself and establishes his authority very adequately as one personally selected by Jesus Christ within the first two chapters of Galatians it would have been sufficient to study who he is from within this context while also providing us the lesson author's understanding of this important New Testament book. Certainly examining the references to Paul and his earlier life as 'Saul of Tarsus' in the Book of Acts is helpful but that could easily have been done from within the context of learning Paul's message he originally wrote to the Galatian Christians. Sadly there is only one reference throughout the entire lessons for this week that comes from this epistle. It is only speculation to believe Paul/Saul was one of those who instigated others to lie about Stephen. As one who was dramatically chosen by the Lord Jesus Christ to be his ambassador to the Gentiles, Paul says in Gal. 1:20 that he would not lie. He would not lie in the writing of the epistle of Galatians and there is nothing to suggest that he was a party with those who did lie about Stephen. It is the power of God through the working of the Holy Spirit that brings a sinners dead spirit to life. No works, most assuredly not even our own good works, can cause that to happen. As this passage makes clear, while we may be a Jew or a Greek or whatever else, in the sight of God we are all part of the one and only church, the Body of Christ, 1 Cor. 12:12 & 27. The church may have many parts yet it is a single unit. Now that faith has come we are all one single unit, the church, that is neither Jew who were once captive under the Mosaic Law nor Gentile who never were nor will they ever be a party of this covenant. Paul shows that the error of those who preached circumcision was their claiming that they could be justified by their works of the law. It was their failed works of the law, not simply the question of circumcision, that these false teacher were preaching that severs a person from Christ. You cannot make a non-biblical definition that only certain parts of the law are no longer to be enforced because what Jesus replaced was whole Old Covenant, not just certain parts of the law (the conditions) that were contained within this now an obsolete covenant. On Friday, instead of doing as is suggested in the quarterly, a better idea would be to read and study your bible. In this case, read and study chapter one of Galatians. After considering the brief introduction and salutation, notice that Paul outlines the purpose for writing to the Christians who live in the Roman Province of Galatia. Since the quarterly title is 'The Gospel in Galatians' it is well to read and understand what Paul has to say about the gospel in these opening verses. Only if you respond in faith to the message that nothing but the shed blood of Jesus Christ will provide atonement, full complete eternal atonement, will you be transferred out of the kingdom of darkness and eternally into the kingdom of God. Only through the Savior's gift of the Holy Spirit will your human spirit be reborn, which occurs as you are brought eternally into the kingdom of God. Your own works, whatever and however good they may be cannot cause this to happen. In faith you must believe and understand that this is totally a work of Jesus Christ. Therefore the Apostle Paul invokes a curse upon anyone who would dare teach anything different. Since the title and apparent theme for this quarter is 'The Gospel in Galatians' this beginning week of lessons should have included an introduction as to how the Apostle Paul outlines what is or is not the gospel in his epistle to the Galatians. The quarterly lesson's for this week fail to do this. While it is certainly reasonable to introduce Paul, the author of this epistle, this could have been accomplished simpler by reviewing what Paul testifies of his apostleship in this key book of the Bible while providing other Scriptures as appropriate to verify or otherwise expand upon what is recorded in Galatians. The lesson author makes assumptions, not verified in Scripture, concerning the plot that led to the stoning of Stephen. While Paul himself testifies that he was an early persecutor of the followers of Jesus Christ there is no evidence that he would have lied, in collusion with the plotters, that claimed Stephen said things that were heresy. We need to remember that Paul's obvious sympathy with the conspirators doesn't prove he was one of them. What the lesson author also fails to mention is that Paul's "conversion" was something accomplished by the will of God without any merit of his own. What this should mean to any of us is that the blood shed by Jesus Christ at Calvary can and will just as easily cover the sins of all other sinners who also repent in faith of their sins. The shed blood of Jesus plus nothing else, is how Paul was transferred out of the kingdom of darkness and into the kingdom of God through the Savior's indwelling gift of the Holy Spirit which included the empowerment of Paul's apostolic ministry and the inspiration of his writings. The is no such thing...then, now or ever...that can be called exclusively "the gentile church" because, first of all, the church was a mystery hidden by God until revealed through " Paul and the other holy apostles" (Rom. 16:25 & Eph. 3:1-10) which includes all whose sins have been covered by the shed blood of Christ, including Gentiles. The local church congregation that meets together in a certain place or time in history is simply a part of the whole universal body of Christ. In the New Testament record we find that in Corinth and elsewhere that Gentiles and Jews met together as one common body because there is only one Savior Jesus Christ with one common gospel message for the salvation of all the world. Paul's message in the epistle of Galatians is that there can only be one gospel. Anything added to or taken away from this gospel is a fake. It is vital for your salvation and eternal destiny to respond in faith to this one and only gospel. Copyright 2017 BibleStudiesForAdventists.com. All rights reserved. Revised June 19, 2017. This website is published by Life Assurance Ministries, Camp Verde, Arizona, USA, the publisher of Proclamation! Magazine. Contact email: BibleStudiesForAdventists@gmail.com.